Growing up I will always associate pickled peppers with Christmas time. Being Italian my family always celebrated La Vigilia -The Feast of the 7 Fishes on Christmas Eve. 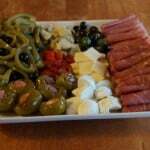 Pickled peppers were usually found on the antipasto platter. However, I fondly remember them served along one of my favorite dishes- the fried smelts. Pickled peppers or sometimes called vinegar peppers are green peppers that are pickled in a salted vinegar and water brine, and packed in jars. It is a simple, tangy pepper that has a vinegar taste to it. It is a simple peasant delicacy. These tasty treats can be eaten by themselves. However, they are great on sandwiches and can be used in some main dishes like; Pickled (vinegar) Peppers and Pork Chop, Pickled (vinegar) Peppers and Italian Sausage and Fried Vinegar Peppers and Potatoes. My favorite way to eat them is on a sandwich; pickled peppers with prosciutto and fresh mozzarella on Italian bread. For me, it just does not get much better than that. Unfortunately I have not had any luck finding these peppers here in Pittsburgh, and I have looked all over the city. So when I go back home, I buy several jars and bring them back home with me. I shared my thoughts on pickled peppers with my friend Holly Costa. She told me that she has a recipe that is easy and you can make pickled peppers in a day. She said “trust me when I tell once you have these homemade ones, you will never want the store bought ones again”. I have known Holly for over twenty years and she is the real deal Italian momma. We went to high school together. I remember back in the day, people asking us if we were related because we looked similar, we had the same dark brown eyes, dark hair and chubby cheeks. Holly has an old school style about her cooking and keeps true to her Italian roots. Holly is third generation from Calabria on her mom’s side. On any given Sunday, you can catch Holly in her kitchen rolling out her meatballs and making her sauce for dinner. She is a spirited Italian woman, who loves her family and takes pride in feeding them well. Holly is the unofficial baker for her son’s hockey team. When she travels for hockey tournaments, she brings enough of homemade cookies for all of the boys on the team (and the coaches too). All the boys have dubbed her now famous chocolate chip cookies “the Mrs. Costa Cookies”, and they all love them. She is a beautiful cook and a talented baker; she is the ultimate kitchen diva. 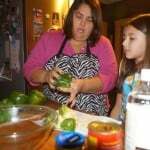 Several years ago, Holly’s mom began to change the way she made pickled peppers. Her mom had always made everything from scratch, including preserving her own peppers. However, this little kitchen trick made pickled peppers easier to have in a shorter amount of time. “My mom’s pickled peppers were good but it was so much work, these peppers are just as good and no jars, (no preserving) are involved” says Holly. 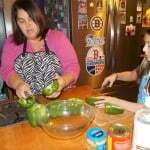 In her family, it is Holly’s job to make the pickled peppers for all the holiday dinners. 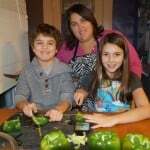 She will gather her children, Jacob and Bella in the kitchen to help make the peppers. By having them with her, she is passing down this tradition to the next generation of Costa children. Like Holly learned from being in the kitchen with her mother, Jacob and Bella are learning from her. They are learning not only about their family and traditions but about their Italian-American heritage. Holly and her family will eat pickled peppers at all of the holidays meals and on New Year’s Day, but according to Holly “you can eat these any time”. 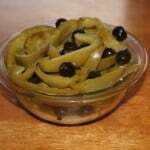 These pickled peppers are great mixed with a little garlic and black olives. 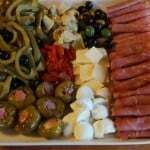 They will go perfectly on an antipasto platter or they are delicious to eat by themselves with some good Italian bread. Holly was generous enough to share her recipe for her pickled peppers. They are a simple to make, and you will have the perfect pickled peppers with little effort. First boil water in a pan, enough of water to cover the amount of peppers that you have but not too much that you will submerge them. Remove pan from heat, then drop sliced peppers in boiled water for 3 minutes. 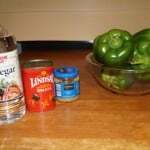 Drain peppers and rinse under cold water. Place in large bowl and add water and white vinegar, cover and refrigerate overnight. 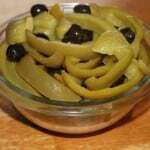 Take out of fridge in morning, drain add a few cloves of garlic and can of black olives. This will yield 1 soup bowl full of peppers. 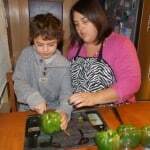 Below are some pictures of Holly Costa and her two children, Bella and Jacob, making the pickled peppers in her kitchen in Cranston, RI.